This episode, and it's second half, are the only ones I have never seen. I want to see them really bad. I heard Iroh gets nabbed by a bunch of earthbenders! What is that about? You have to see this one, Zukofan, it has the funniest moment between Iroh and Zuko (which I better not spoil for you). Having just re-watched Princess Mononoke I was struck by the similsrity between the movie and this episode. Both feature an animal spirit/god who goes on a destructive rampage after humans destroyed its forest. Zuko: "Get out of the water!" 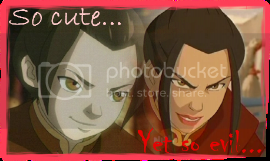 Zuko: *cringes/holds up hand and looks away* "...ONNN second thought, why don't you take another few minutes...?" Zuko: "...now would you PLEASE put on some CLOTHES?" I'm afraid I once again found Zuko's side of the story much more interesting than Aang's, though I did love Sokka's "Yeah... ... we're all gonna get eaten by a spirit monster." I enjoyed this episode for OTHER reasons than most. Iroh hadn't until this episode done anything to prove what a brilliant strategist he is, which is nice. However, the one thing that highlighted this episode was Iroh seeing Spirit Aang on the dragon fly past. And only he saw it, which hits you in the head with the fact that he isn't just some goofy uncle figure. Which is solidified later on when it is revealed that Iroh had gone to the spirit world. I have to wonder if that will ever be touched upon again . . .
"Where we're going, you won't need any pants!" I'm sure this question has been asked and/or answered before, but how was Iroh able to see Aang while he was in spirit form? After Iroh was captured by the earthbenders, he sees Aang flying Roku's dragon overhead, and gasps. It seems he's the only human character that has the ability. Was this ever explained during Season 1? If so, I was clearly not paying attention. Its been noted in newer episodes that Iroh has been to the spirit world. are you in europe or elsewhere grant? I do recall Iroh being very knowledgable of the spirit world and its inhabitants, but I didn't know he was actually there. Thanks for clearing that up for me. I rated it a 9, but I should've rated it a 10. This was an awesome part of an awesome 2 - part- episode. I loved it. It was really exciting and made me go EEEE!!!! and the ending was great too. Shiou (sp?) should;ve gone with them. Friends are worth more than any gold or jewels. Uh well... My opinion about this story is devided. I didn't like the Aang-part of the story. I don't know. I mean, Sokka was funny as always, but Aang and the monster... I can't explain why, I just didn't like it that much. The Iroh/Zuko-part was excellent. I just read an old thread where there is said that Zuko treats Iroh unfair and should respect him more. I think this episode shows clearly how much Iroh means to Zuko. And I loved the scene when the earthbenders were going to smash Iroh's hands and Zuko finally safed him. And during the following fight they both worked together so perfectly - what can show better how close they are? And TimKai is very right with Iroh being a "brilliant strategist". IMO it's a bit a pity that Iroh mostly is presented as an odd old man in the stories, though he is probably one of the most powerful and most clever characters of "Avatar". He deserved that episode. Well, and the bath scene... No need to talk about this, yeah? One of the best scenes existing! BTW: has anyone noticed that Zuko once acted like Iroh in that episode? At the end: The fight is over, the earth benders are defeated, lying on the ground, Iroh just safed from evisceration. Zuko: "Now please put on some clothes." ^^ In my opinion this is like typical Iroh-acting. Perhaps Zuko will become similar to Iroh when he gets more patient and level-headed? You know what I find the most interesting part of this episode? That Sokka went into the Spirit World. I really wish he would try to go back, perhaps to see Yue. It would be so very awesome to see an episode where that happens. He went to the Spirit World? Hmm, I was under the impression that he was just hidden by Hei Bai somewhere. Could this mean that Iroh went into the Spirit World the same way Sokka did? I loved watching Iroh fight with the chains on his wrists. It reminded me of some action movie, it just looked so cool! So, Roku's dragon. Loved its looks, hated its name! Fang?! Come on! My favorite part of this episode is when Iroh and Zuko take on all those earthbenders. A loose quote: "Surrender, you're clearly outnumbered." Iroh, "True, but you are clearly outmatched." And then a great fight scene occurs. This alone made it a 10 for me. 792 shiny new DVD screenshots are now available for this episode in the DVD screenshot section of the mainsite. I liked the plot of this episode, and the opening scene was classic (XD), but the animation in this episode was really bugging me. They must have animated it at a different studio or something, because a lot of the characters look different than in other episodes. Particularly Aang's eyes; they look shinier than usual. Keeper of Aang's Tsungi horn, Aang's "PENGUIN!!" and Foofoocuddlypoops' mother. My favourite moment in this episode was when Aang found out that Hei Bei was the Spirit of the forest and when he gave him the acorn... That was sooo.. touching. I nearly cried at this point. Which is not typical of me at all. And of course, the story of Iroh and Zuko was unforgettable . And I liked it when Zuko said: "You taught me well." Suddenly you realise that Iroh indeed has done for Zuko far more that his own father has.